If you’re looking to move a piece of bulk storage equipment, we can probably help. At Alliance Truck and Tank, we take trade-in’s, purchase used equipment, and also sell equipment on consignment. The route taken depends on the item, its condition, and your desired outcome. As the name implies, a trade-in can be used toward the purchase of new equipment. If you aren’t interested in buying anything new, we might be interested in purchasing your equipment outright or can help you sell it on consignment. If you want the most possible money for your equipment, you’re better off selling it yourself. However, this takes time and maybe more effort than you’re willing to invest. On the positive side, trading in your equipment can be quick and easy. The most important step when trading in equipment is to assess the value. It’s important to accurately take stock of all the equipment options and to be honest about the condition level. Keep in mind that the trade-in price you’re offered can vary depending on a number of factors, including the equipment’s condition, similar equipment inventory levels, and how likely it is that the equipment will sell. The keys to a successful outcome are knowing what your equipment is worth and being realistic about the offers you get. If you’re interested in getting the best possible price and have the time and market knowledge, you might want to try selling the equipment yourself. If going this route, you’d be wise to first assess market demand for the equipment, determine a competitive price, and get all certifications and maintenance up to date. A fresh coat of paint can help too! We might be interested in purchasing the equipment from you. Whether it’s Alliance Truck and Tank or some other buyer, once you’ve settled on a negotiated price, it’s likely that the buyer will want to conduct an inspection. Finalize the sale with appropriate documentation and don’t forget to take care of title transfers and cancel any insurance you were carrying on the equipment. Trading arrangement in which a seller sends goods to a buyer or reseller who pays the seller only as and when the goods are sold. The seller remains the owner (title holder) of the goods until they are paid for in full and, after a certain period, take back the unsold goods. Selling something on consignment can provide the best of both worlds. You get the convenience of a trade-in and a price similar to what you’d expect when selling on your own. For our consignment sales, we ask for 5-6 pictures of the equipment, a picture of the data plate, item description, and specs. And you’ll need to decide how much you want for it. 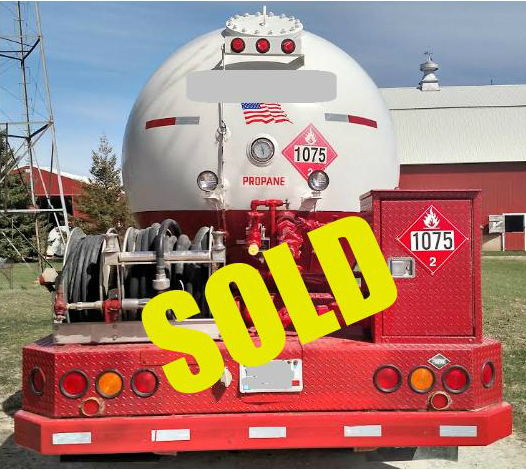 All consignment items are marketed to our database of over 2,500 retail propane businesses located in the U.S. and Canada. In return, we ask for a percentage of the sale price which we typically add to your asking price. We can also help you determine the sale price if needed. Once an interested party is identified, we’ll connect them directly to you to answer questions or to schedule a visit. When it comes to marketing your equipment, high quality pictures can make a big difference. First appearances are especially important for products being marketed online where decisions are made in a matter of seconds. When taking pictures, make sure you get several angles and highlight any key features. Pay attention to lighting – it’s always best to take your pictures either first thing in the morning or just prior to sunset. Keep the sun at your back and make sure you have a background that will provide contrast and make your equipment stand out. There’s currently strong demand for good used equipment. If you have a piece of equipment that you’re no longer using or you want to upgrade, now is a good time to sell.